Daisy Jane and Rock Bradley were two of the most notorious bank robbers in the American Southwest. And then they fell in love. Sometimes you read a description of a new comic book and know a book is going to be something special. 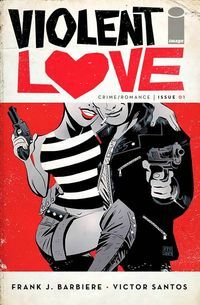 In less than 25 words, I was immediately hooked on the premise behind Violent Love, the newest pulp-infused criminal romance series by Frank J. Barbiere (Five Ghosts, The Revisionist) and Victor Santos (The Mice Templar, Polar). 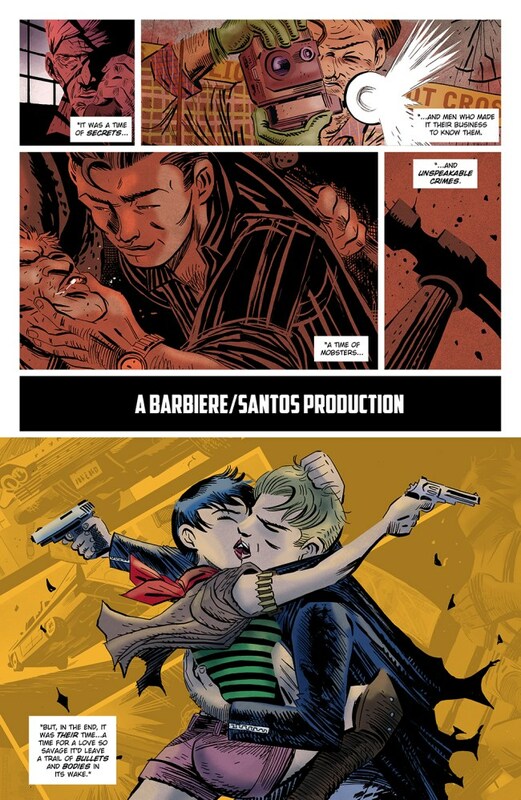 We had the chance to chat with the Barbiere and Santos in an exclusive interview, and we think that you’ll fall in love with this series too — both creators are throwing their all at Violent Love and their passion comes through in the preview pages that are included below. TFAW: Victor, what’s it like going from a series you wrote and drew in Polar to just drawing this series? Victor Santos: Even though my career in Spain and France was as a complete author, I’ve worked mainly as artist in the USA. Polar books (and a little collaboration in the Boom! Regular Show series) have been my chance to write again, but they feel a little restricted because my native language is Spanish. I don’t think working with writers is an imposition, it’s a marvelous school for me. I’ve learned from Azzarello, Glass, Oeming, Van Lente, and all the people I’ve collaborated with. There isn’t a rulebook for this, so every writer has their method. I enjoy it. And most important: having another writer forces you to surpass your safe place and improve. And there’s something more readers don’t notice. Working with Frank is easy, the story is great and this is important, of course. But the world is full of talented writers, and in the day-by-day you mostly need an effective and generous collaborator. Frank’s vision of the story is so clear and direct, he really quickly evokes great images in my mind…I usually forget I’m reading in another language and believe me: this is an unusual talent! TFAW: People have likened this series to a Bonnie & Clyde or True Romace comic, would you say that’s a good comparison? 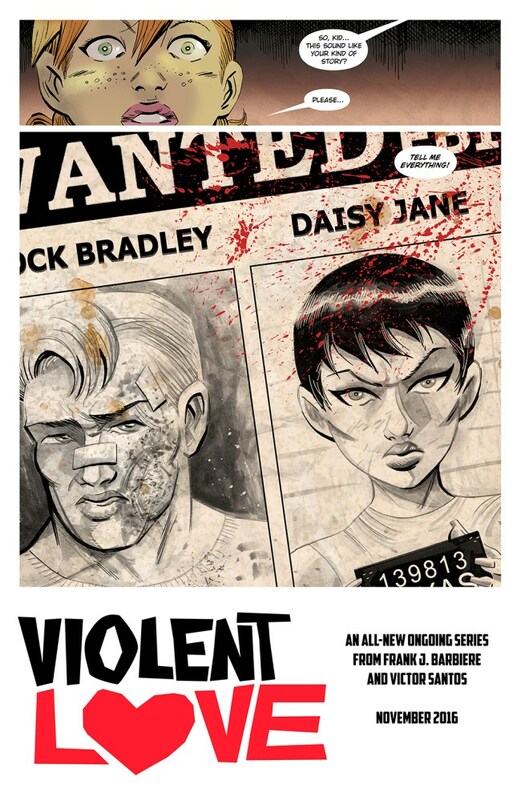 Frank J. Barbiere: Both of those stories are extremely influential, but while this certainly is a “criminal romance” our story focuses a lot more on our female lead, Daisy Jane. There’s also a pretty unique frame story in play — the story of Daisy and Rock is being told to a young girl many years after it happened — and I think it gives the story a bit of a American folk tale vibe. It also leans into our “inspired by true events” tag line — we know we’re not going to see anything totally out of genre like aliens, monsters, etc., so the whole thing feels very authentic and like the reader is part of something bigger. Violent Love is meant to really evoke a feeling of nostalgia and Americana. TFAW: You mentioned the tagline. Can you elaborate a bit on this story being inspired by true events? 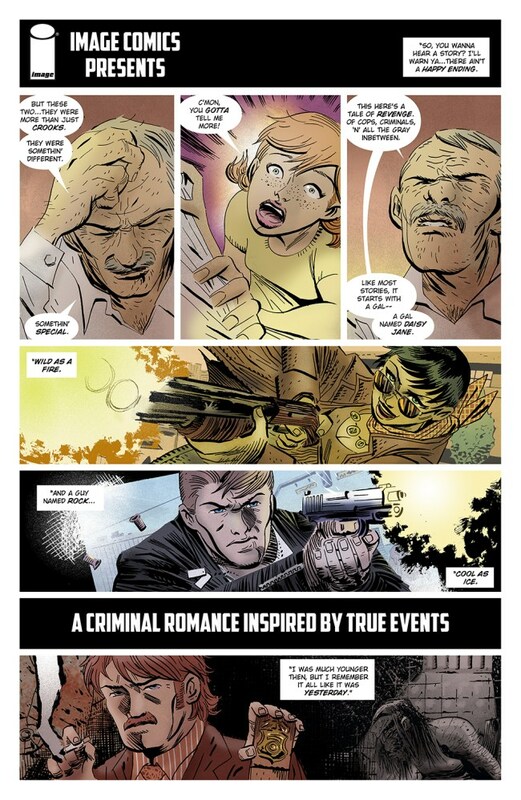 Santos: Well, I think I used the “Criminal Romance” title in some “concept art image” because I loved how it sounds…I’ll leave this mystery of true events to Frank (ha, ha). Barbiere: When Victor and I began developing Violent Love we both decided we’d love for it to have a “true crime” feel to it — to be a story that you could imagine happening in the real world, despite having exciting genre elements. By telling our readers upfront the story is inspired by true events we offer them an idea that the story has a feel of authenticity and that everything you’re seeing is being recalled — it gives it a very unique and fresh feel that also works in tandem with our frame story. Violent Love is meant to really evoke a feeling of nostalgia and Americana, and our “inspired by true events” tagline is another tool to help. In terms of the specifics…our readers will just have to do some thinking on their own to figure that out. TFAW: Can you tell us a little more about the inspiration for Violent Love? Santos: The movies we’ve discussed, pulp novels…I love the ambiance of Jim Thompson’s stuff, the spirit of the Wild West. Some ’60 and ’70s comics — I love the ’70s Marvel comics, with people like Gene Colan or Paul Gulacy, with more noir, blaxploitation and kung-fu. And classic romance magazines, with people like Alex Toth or Dan DeCarlo charming the female readers. There is something maybe is not so apparent: I love classic comics but at the same time, I belong to the manga and anime generation, so they have a big influence on my work. I find the expression of the emotions crucial, I put a big part of my efforts on it, and Japanese books play this game terrifically. Barbiere: Victor is one of my favorite artists working and I knew I wanted to dive into something with him when we wrapped Black Market at BOOM! Studios. Violent Love is the culmination of all of our interests and genre loves — it really is a dream project, and a very pure vision from us. We wanted to challenge ourselves to tell a love story within the genre as well, to grow and do something new. This book is a labor of love on our end and we’re extremely proud of it — we hope to keep readers on board for a very long time and constantly surprise them. TFAW: Victor, I loved the style you put into your Polar series, but it was different than your work on Mice Templar. Violent Love seems to be somehwere between, can you speak a little on that decision? Santos: I try to transform myself into the artist that every unique project I work on requires. Maybe it’s not the best decision for my career, maybe I should have a line/style totally unique and never change it…but it’s so boring! I love to change and experiment. Polar is pure styling, high contrasts of black and white, a world where almost superhuman hitmen live. Its storytelling is a exciting artifice and every page is like a jigsaw. Violent Love is more “on the ground,” it’s not completely realistic, but it plays in real places, real starting points, a real age. It needs more texture and a different color approach, with grain and sand. TFAW: Anything new on the horzion that we should be keeping an eye out for? This book is a labor of love on our end and we’re extremely proud of it. Barbiere: Violent Love is going to be a long haul for us so we’ll be promoting it for many months to come! It’s really become my focus — we’re both committed to telling the absolute best story we can, and I’m glad I’ve been able to hunker down and focus on it. I’m also working on a book called The Revisionist at Aftershock Comics that I’d love more people to check out — it’s the story of a time traveling assassin and does a lot of fun stuff with the genre. Santos: I just finished the third Polar: No Mercy for Sister Maria, and my plan is to close the trilogy there. Right now I’m also working with Dark Horse on the US edition of one of my Spanish noir graphic novels, Rashomon: A Case of Heigo Kobayashi. As you easily deduce, it’s a noir story set in the Feudal Japan, and it’s inspired by the tales of classical writer Ryonosuke Akutagawa (with a touch of James Ellroy). It will be published next year. TFAW: What are you most excited about with Violent Love? Barbiere: The chance to tell a story with Victor that we are both extremely passionate about with Image Comics. Image gives us 100% control of the material down to the type of paper we print it on, so this is a completely authentic vision from Victor and I. We really hope readers connect with it and care for these characters — this book encompasses everything we love about comics and genre, so we hope people follow us for many issues to come. Santos: I think this is a kind of story you would love if you are a classic noir fan, but at the same time a new reader will enjoy a lot. We have been working on a daring storytelling but accessible. That’s the kind of comics I love because even with the movie references I told you, it has that artisan and care level a movie never will have. This story is told with the resources, technique and heart make comics so fun. TFAW: What comics are you enjoying right now? Barbiere: I try to keep extremely current with the comic book industry, as well as always diving back and checking out things I’ve missed. I’m really enjoying Steve Orlando’s new Supergirl title and on the creator owned front I’ve been absolutely floored by Kill or be Killed and Black Monday Murders. In terms of prose, I’ve been reading The Fireman by Joe Hill. Santos: I love all the stuff from writers like Brian Azzarello, Ed Brubaker, Greg Rucka, and Warren Ellis. A lot of creator-owned from publishers like Dark Horse, Image, and Boom. I’m not totally connected with what all the big publishers are doing, but I buy all the stuff that artists like Gabriel Hernandez Walta, Javier Rodriguez, Declan Shalvey, Chris Samnee or David Aja are doing in the US mainstream books. I’m superfan of the Panel Syndicate online, too. Outside the U.S., I’m reading books by Osamu Tezuka, Koike/Kojima reprints, or the French hit Lastman — they are some of my favorite books right now, too. We want to thank Frank and Victor for taking the time out of their busy schedules to chat with us about this exciting new series! Have you checked out other books by Barbiere or Santos? Are you as excited about this new series as we are? Join the conversation by posting your thoughts below and use the buttons below to share this article.